Finding the perfect engraved gifts for any occasion is easy now that you know about Frederick Engraving! 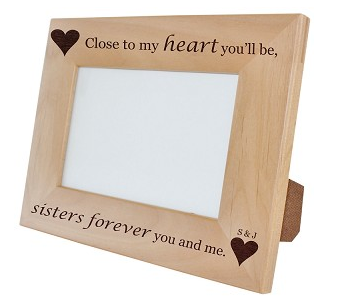 We have a wide array of personalized gifts to fit your budget and needs. From engraved wine glasses to monogrammed necklaces, we can customize items to give them a personal touch that your recipient will love and appreciate. Personalized gifts are a great way to show you care, whether for professional or personal reasons. Taking the time to find the perfect engraved gifts for friends, family, or colleagues shows you’ve taken that extra step and thought. We have gifts that can serve as wedding favors, birthday gifts, tokens of appreciation, and more! With items ranging from cutting boards to flasks, picture frames to jewelry, we have the inventory you need to customize and create something perfect. Our options even include a different selection of wood choices for natural items and a rainbow of colors for acrylics, so you’re not just limited to what you see. Find just the item you need, add your personalization or monogram, select a color and design where applicable, and you’re ready to go! While many places offer custom items, none have the courteous customer service and help that Frederick Engraving offers! As a small business, we understand how important client care is, and we’ll go above and beyond to make sure your order is perfect, every time. When you need engraved gifts with a selection and price you can’t find anywhere else, trust in us for perfect items that will keep everyone smiling!